Wondering where to stay when you are going to Disney on vacation? You will find several different Disney World Resort options for all prices levels. Disney’s Contemporary Resort -Inside, a 90-foot-tall mural by Mary Blair celebrates the Grand Canyon and the American Southwest. Dining options include California Grill, The Wave…of American Flavors, Contempo Café and Chef Mickey’s Fun Time Buffet. You will find two heated pools with slide, whirlpools, interactive water feature, leisure pool and poolside cabana rentals. The Resort is walking distance from Magic Kingdom Park and includes Monorail service. Disney’s Grand Floridian Resort & Spa – Victorian themed resort with modern elegance. Dining at Cítricos, Victoria & Albert’s, Gasparilla Island Grill, Grand Floridian Cafe, 1900 Park Fare, Narcoossee’s and two lounges. Recreation and amenities include boat rentals, swimming, poolside cabanas, fishing, playground, health club, basketball courts, jogging trail, campfire activities, game room, and shopping. Easy access to theme parks via watercraft, motor coach and monorail. Disney’s Polynesian Village Resort – The resort is designed with South Pacific Island theme along the beach of Seven Seas Lagoon. Dining options include ‘Ohana, Kona Café, Captain Cook’s, the “Spirit of Aloha” dinner show, & Trader Sam’s Grog Grotto. Recreation and amenities include swimming, boating, jogging, playground, game room, & shopping. Transportation by monorail, watercraft and motor coach. Disney’s Wilderness Lodge – National park-like setting that looks like the Old Faithful Inn at Yellowstone Park. Features a six-story lobby with an impressive 82-foot-tall stone fireplace. There is a bubbling hot spring in the lobby that expands outside the building into a roaring waterfall flowing into the swimming area (featuring hot and cold spas). A geothermal “geyser” erupts hourly from a rocky outcrop at the edge of Bay Lake. Recreation and amenities include bike and boat rentals, swimming, & playground. Dining options include Artist Point, Whispering Canyon Café, Roaring Fork, & Territory Lounge. Copper Creek Villas & Cabins at Disney’s Wilderness Lodge– showcasing the pioneering heritage of the Pacific Northwest this resort is steps from Magic Kingdom park. 2 pools to choose from: the playful Copper Creek Springs Pool or the easygoing Boulder Ridge Cove Pool. Disney’s Fort Wilderness Resort and Campground – Cabins all set in a relaxed 750-acre wilderness setting. All campsites have close access to air-conditioned comfort stations with private showers, coin laundry facility,& vending machines . Wilderness Cabins are air-conditioned accommodations that sleep up to six guests and feature vaulted ceilings, fully equipped kitchens, bathrooms, television, outdoor grills, picnic tables and a private deck. Amenities include watercraft, beach, fishing, tennis courts, two heated swimming pools, arcade game room, laundry facilities and kennel. Campfire and marshmallow roast with Disney characters and a Disney movie are also a special treat. Motor coach and boat transportation links campground with all Walt Disney World Resort areas. Disney’s Pop Century Resort –This value-priced resort features buildings and furnishings inspired by the 1950s, 60s, 70s, 80s and 90s. Recreation includes three pools, a kiddie pool, & the Pop Jet Playground. Dining Options include Everything Pop food court area or Petals Pool Bar. Disney’s Caribbean Beach Resort – this colorful Caribbean-themed resort is located on a 42-acre lake. Recreation includes a lakeside recreation area with a themed slide, boat rentals, swimming, playground, game room, bicycling, nature walks, jogging track, laundry facilities and shopping. Dining available at Centertown Pavilion or Spyglass Grill for breakfast, lunch and dinner. Transportation to theme parks available by motor coach. Disney’s Yacht Club Resort – visit the New England seashore hotels of the 1880s. All rooms feature French doors that open onto porches or balconies. Dining available at Ale & Compass Restaurant, Yachtsman Steakhouse and two lounges. Transportation via watercraft and motor coach. Disney’s Beach Club Resort – inspired by New England beach cottages of the 1800s. Stormalong Bay features three lagoon areas and a thrilling water slide; the Ship Shape Health Club with steam bath and sauna, and massage, weight and aerobics rooms; a marina with motorized watercraft. Dining in Cape May Café and two lounges and Beaches & Cream, an old-fashioned ice cream parlor. Disney’s BoardWalk – The BoardWalk Inn takes you back in time to the 1930s on the Atlantic BoardWalk. Dining includes Flying Fish Café, Big River Grille and Brewing Works, ESPN Club, Trattoria al Forno, Seashore Sweets’ and BoardWalk Bakery. Disney’s Saratoga Springs Resort & Spa – a homage to Saratoga Springs New York in the 1800s. Features is a full-service spa and health club, and pool. Dining at The Artist’s Palette – a counter-service restaurant and market. Bus transportation is provided to all four Walt Disney World theme parks. Disney’s Port Orleans Resort-French Quarter – French Quarter-style buildings along the river. Dining at Sassagoula Floatworks food court and pizza delivery. Themed pool, boat rentals, lounges, game room and retail shops. Riverboat to Disney Springs. Linked by motor coach to all other Walt Disney World resorts and entertainment facilities. Disney’s Port Orleans Resort-Riverside –Southern-style mansions and two-story rustic bayou dwellings. Recreation includes Ol’ Man Island swimming hole with slides, playgrounds; quiet pools; & boat rentals. Riverboat to Disney Springs. Transportation via motor coach to other Walt Disney World attractions and resorts. Dining includes Olivia’s Café, poolside fare at the Gurgling Suitcase, and Good’s Food to Go quick-service restaurant. Health club, tennis, swimming pool, sauna and planned recreation. Linked by motor coach to all other Walt Disney World resorts and entertainment facilities. Disney’s Animal Kingdom Lodge – Designed after an African with 24-hour views to its own 46-acre savanna of free-roaming mammals and tropical birds. Features two full-service restaurants – Boma-Flavors of Africa and Jiko-The Cooking Place – plus a mezzanine lounge and a quick-service eatery, Mara, with poolside dining. Features three “quiet” pools and a family-fun pool with a water slide. Dining includes the Maya Grill, Las Ventanas, Pepper Market dining court, Rix Sports Bar & Grill, Laguna Bar lounge, & Siestas Cantina poolside bar. Special services include La Vida Health Club, hair-styling salon, bike rentals, watercraft rentals, arcade, sand volleyball court, kiddie pool and playground. Expansive pool area with bubbling fountains and water play area, bike rentals and arcade. Dining options in the main Animation Hall include a poolside snack bar, pizza delivery and Landscape of Flavors food court. Use of Walt Disney World transportation system is included. Disney’s All-Star Sports Resort – Larger-than-life sports icons representing surfing, basketball, tennis, baseball and football. Features two swimming pools and a kiddie pool, a pool bar, pizza delivery and laundry facilities. 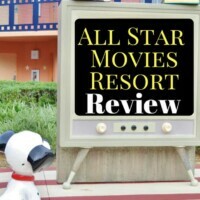 Disney’s All-Star Movies Resort – Giant icons from favorite Disney movies like “101 Dalmatians,” “Toy Story,” “Fantasia,” “The Mighty Ducks” and “The Love Bug” adorn the resort hotel. Disney’s All-Star Music Resort– music sets the stage with buildings showcasing jazz, rock, Broadway, calypso and country music. Walt Disney World Swan and Walt Disney World Dolphin Resort– convention center that connects to Epcot, Hollywood Studios and BoardWalk. Boasts seventeen restaurants and lounges, four swimming pools, two health clubs and a wide area of recreational activities. Connected to Epcot, Disney’s Hollywood Studios and Disney’s BoardWalk via water and walkway. 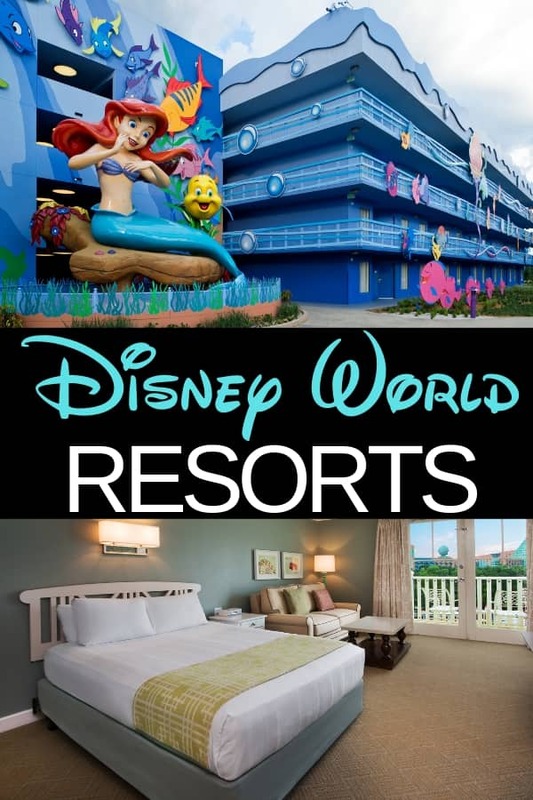 Find infromation on value, moderate & deluxe Disney World resorts.